Fashionistas with a fetish for luxury designer goods will get a kick out of these couture cereal boxes by Tricia of The Glam Foodie and Sip, Chat, Chow. "I wanted to take something we all crave and give it a luxury lift," she wrote. "This tasty, chic collection gives a high-end, glam aesthetic to our favorite breakfast treats." 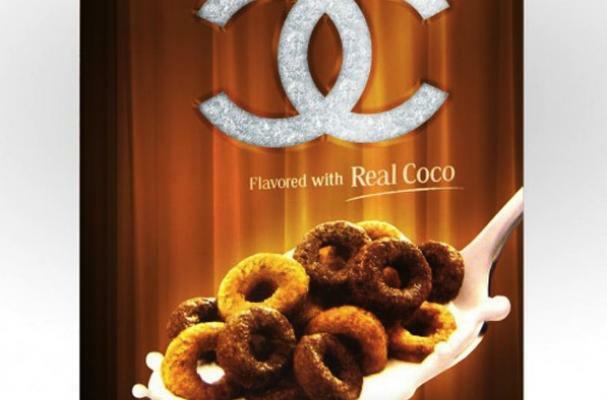 The couture cereal includes Burberry Flakes with Tony the Tiger, Cartier Crunch with cinnamon swirls, Gucci Loops, the Coco Chanel cereal above, and Louis Vuitton Charms. If these were actually available at the department store, would you buy a box?